Description: This Australian-raised hybrid cultivar, displaying characteristics of both parents equally, has become a firm favourite with gardeners in several countries. 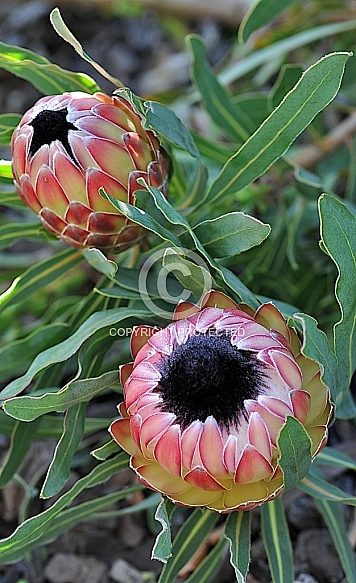 In South Africa a very similar cultivar ‘Pinita’, is also sold by nurseries. Both cultivars have handsome floral bracts that are tipped with orange-bronze shades and fade to cream at their bases. The large, prominent flower heads are well displayed on a bush that reaches 2 m in height with a similar width and are suitable for picking purposes. They are mainly produced from late winter through spring and nectar seeking birds find them attractive. ‘Possum Magic’ is wind-tolerant and drought-resistant once established and will withstand the occasional frost as low as -4 ºC . Sunny, well-drained positions are required.